A phantom haunts Nicolas Roeg’s 1973 phantasmagoria Don’t Look Now, but the ghost is not so much situationally incorporeal as intrinsically incomplete, a lingering devastation wrought by the remnants of the past latching onto the psyche of the present. The psyche tellingly belongs not only to main characters John and Laura Baxter, who lose a child to a lagoon in the opening scene and trip to Venice to let off some steam, but to the film itself. This is because theme is sublimated into the higher realm of form in Roeg’s post-Bava sensory saboteur, a work that lithely reorients our conception of cinematic editing as it construes a complete and utter subjectivity out of discordant, hostile cutting mechanics. Horror is found not in the presence of a wraith from beyond the grave, but in the lasting haunt of the past’s icy grip on the canvas of the human mind. Ghouls and zombies do not need to rise from the Earth when they persist in the heart. 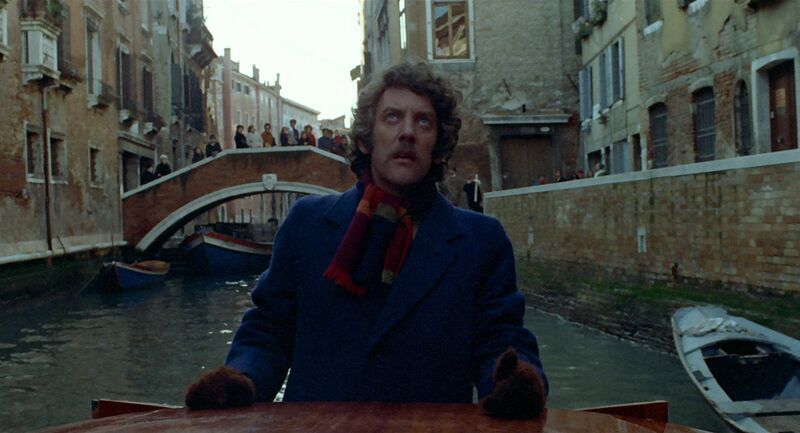 Ultimately, Don’t Look Now is a master-class in “psychic entropy”, dismantling the very ligatures of cinema and blinkered assumptions of a rational, fully-knowable world order. Its vision of new knowledge is radically self-splintering, suggesting that a path to truth compromises our very foundational assumptions about time, space, and rational order. Don’t Look Now offers a form of sensory and mental awakening that is ultimately emotionally and physically catastrophic. This entry was posted in National Cinemas, Review and tagged British Cinema, destroy that continuity editing and grind it to a pulp for me why don't you, Donald Sutherland, haunted beauty, Julie Christie, kind-of-horror-but-totally-horror, landscape-of-the-mind, National Cinemas, Nicolas Roeg, Score: 10/10 on August 18, 2014 by jakewalters98.